Dropped by after long walk wanting a decent pint and a good sandwich or two: didn't get either. Very poor pint of Special plus two OK Scotch eggs from the bar that had clearly not been properly cooled in running cold water (grey/brown rings around the yolk). OK basket of chips. But what kind of pub doesn't do sandwiches? Cold, no atmosphere; usual bunch of boring saddo drunks at the bar talking sh!te. Wish I'd spent money elsewhere. Young barman was nice and helpful. Nice pub but beer I had was mixed. Youngs was good but the Tribute had some diacetyl. 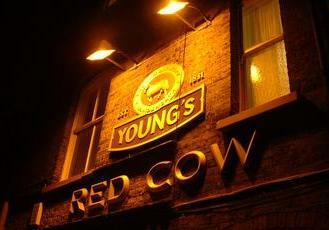 Seems to charge more for beer than other pubs in Richmond - even other Youngs pubs. Bar staff often too far up their own backsides to serve customers. Only time its worth coming here is in Summer when the Green and river are too busy. After failing to get into the pub 30 minutes earlier while the rugby as it was banged out, I ventured across the road and then returned. 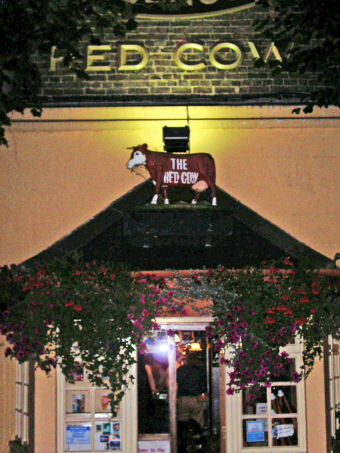 While the White Horse was full of families and kids the Red Cow was very different and much more "grown up". 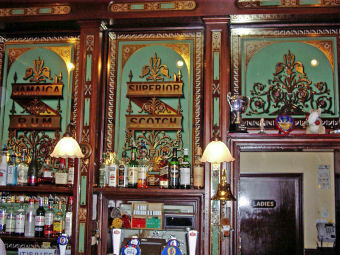 Victorian painted glass panels behind the bar, with the beer selection being St Austall's Tribute, Young's Bitter & Twickenham Redhead on hand pump. A very decent pub that I aim to come back to in the near future...great position on the main road and a short stroll from Richmond station.